Both the Year 4 and the Year 5 Choirs travelled to Cleethorpes to take part in the music festival there. Held in in the Memorial Hall, both choirs sang the set piece Hot Air Balloon and their own choice pieces admirably. The Year 5 Choir just beat the Year 4 Choir by one mark. However, it was the turn of Year 4 to be victorious in the Hymn Class, as they sang Abba Father beautifully to win their first ever trophy. Well done to all the children! see how much the children had progressed with their instrumental studies throughout their time in the Junior School. There were performances on brass instruments, woodwind instruments, violins, cellos and guitars as well as piano and vocal items. as some who have been playing for some while. All the children conquered their nerves admirably to perform to an appreciative and large audience. Well done to all! The Year 5 Choir travelled to the Albermarle Music Centre in Hull to compete against other Hull Primary schools at Hull Music Festival in March. The choir were once again successful in both of their classes, winning two awards. 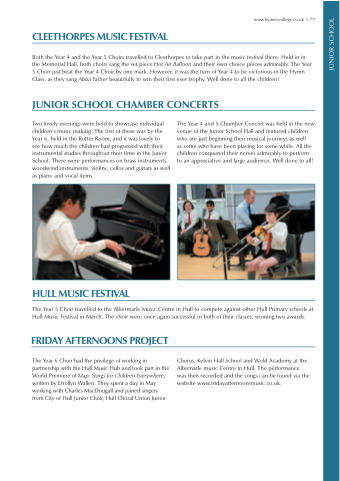 Chorus, Kelvin Hall School and Wold Academy at the Albemarle music Centre in Hull. The performance was then recorded and the songs can be found via the website www.fridayafternoonsmusic.co.uk.